What is Medicare? Original Medicare is health insurance coverage that’s managed by the federal government. Medicare is a medical health insurance plan which was established by Congress in 1965. Those who have paid 10 years of security taxes can take Medicare at the age of 65 or if you have certain disabilities. Medicare covers medically necessary healthcare services. Medicare includes an annual Part A Insurance deductible and an annual Medicare Part B deductible. Who is Eligible For Medicare this year? Medicare is health insurance provided to individuals 65 or older, people under 65 with certain disabilities, and all individuals with End State Renal Disease “ESRD”. 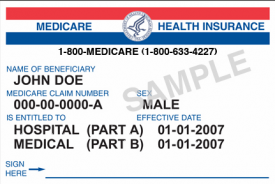 When will I receive Medicare Insurance coverage Part A and Part B? Individuals under 65 and disabled will automatically receive Medicare insurance coverage after receiving disability payments for 24 months. If you have ‘ALS’, the month your disability begins is the date you’ll receive Part A and Part B. Does Medicare Have a Network of Providers? Original Medicare doesn’t have a specific network of providers, such as an HMO. You can have services at facilities and providers who’re accepting new patients and belong to Medicare. You won’t need to choose a primary care physician (PCP). There’s no need to get a referral to see a specialist. No need to worry about filing paperwork for covered services, facilities, or equipment. Filing Medicare claims is done by the providers. Make sure your providers and facilities accept assignment. Most providers, such as doctors, specialist, and hospitals, sign an agreement to accept assignment for all Medicare-covered services. Medicare Part A is your hospital insurance coverage. Medicare Part B is your medical insurance. The standard 2014 Nebraska Medicare Part B premium is $104.90. Most people have this amount automatically deducted from their Social Security checks. What’s Not Covered by Medicare Insurance Part A and Part B? Medicare Part C is Medicare Advantage. Medicare Advantage Plans often times include Part D prescription drug coverage. Advantage Plans are available in specific services areas. They’re generally network based such as an HMO or a PPO. MAPD plans sometimes cover services not covered by Part A and B. Enrollment in a Medicare Advantage Plan is generally for an entire year unless you qualify for a Special Election Period. If you enroll into Part C, the Advantage Plan insurance company pays for your health insurance coverage instead of Medicare. I do stress, that you STILL have Original Medicare and the option leave and return to Part A and Part B during certain times of the year. Enrollment into a Medicare Advantage Plan with Prescription Drug Coverage (MAPD) will automatically end another MAPD plan or Part D stand-alone insurance coverage. Part D insurance coverage can be purchased by Medicare-Approved Private Insurance companies. Depending on your area, there are multiple Part D insurance companies. Enroll into Part D coverage certain times during the year. Enrollment generally last an entire year. Reviewing Part D insurance coverages and potential changing plans annually prevents seniors from overpaying for their medications. The main time to change Part D plans is “Annual Election Period” now called “OEP”. ‘OEP’ is from October 15-December 7th. Find Medicare Part D Prescription Drug Plans from multiple insurance companies in your area. Avoid a Part D Late Enrollment Penalty. You could be accessed a 1% penalty per month for not purchasing Prescription Drug Coverage, Part D. Find out more on late enrollment penalties at “www.Medicare.gov“. Some Healthcare providers who accept Medicare patients, accept ‘Assignment’. These providers are accepted to charge according to the Medicare guidelines. Providers who do not accept this assignment can charge up to 12% more than the Medicare-approved amount. Before provider’s service, you should ask whether they will accept the assignment approved by Medicare. Call one of Retirement Transitions Specialist if you would like to speak to someone without waiting on hold and pressing multiple extensions. We will answer your Medicare Sign Up questions and concerns.